During the course of zoological history, mistakes have sometimes been made when recording the provenance of an animal specimen, often resulting in all manner of confusion and controversy. Fortunately, the mistake is generally nothing more dramatic than a wrongly-noted locality within a given country, or, more rarely, a wrongly-ascribed country. It is quite exceptional, however, for a specimen to be assigned to entirely the wrong continent. 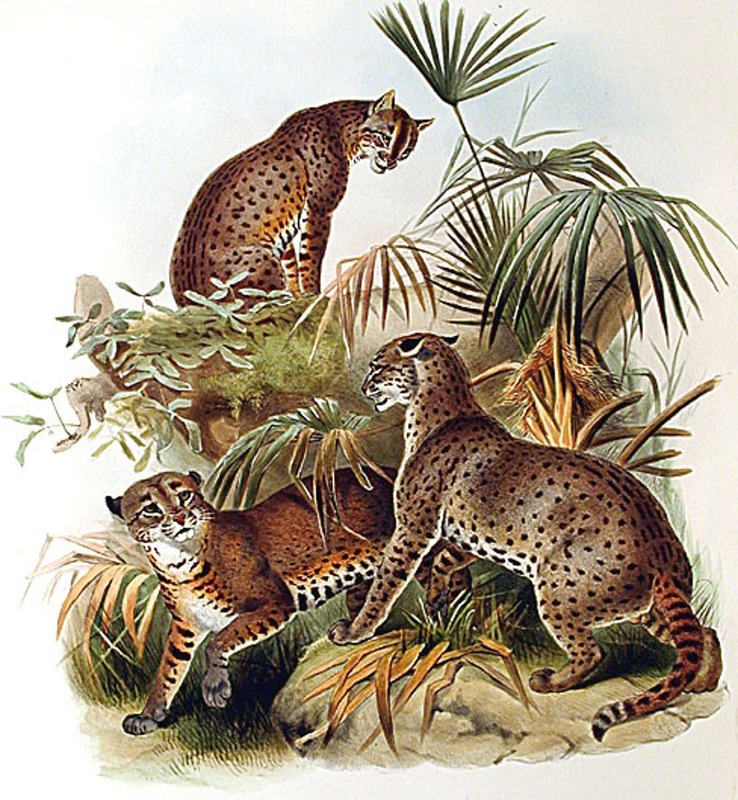 Nevertheless, this monumental error happened with both of the short-lived felid species documented here – and, to make matters even worse, it was the same well-respected zoologist who was responsible for having done so in each case! On 11 April 1867, within a Proceedings of the Zoological Society of London paper, eminent British zoologist Dr John Edward Gray formally described and named several new species of felid, based upon specimens in the collection of the British Museum. One of these new species was Felis pardinoides, whose type specimen was the preserved skin and skull of a juvenile individual that had been received by the British Museum from the Zoological Society’s own museum. According to its provenance label, it had been obtained in India by a Captain Innes. 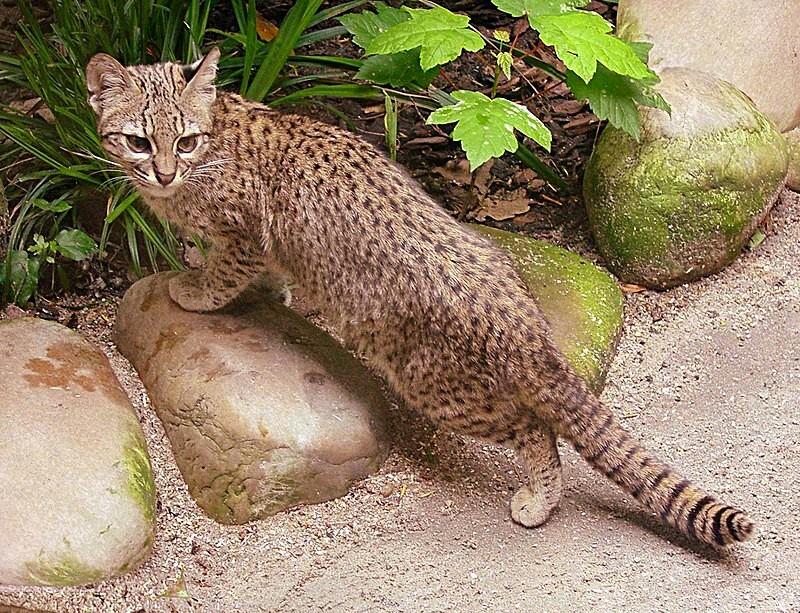 A small spotted cat, its head and body length was 19 inches, and its tail length was 9 inches. In the ‘Proceedings’ of this Society for 1867, p. 400, Dr. Gray has described a Cat as Felis pardinoides, giving as its habitat India. The typical [i.e. 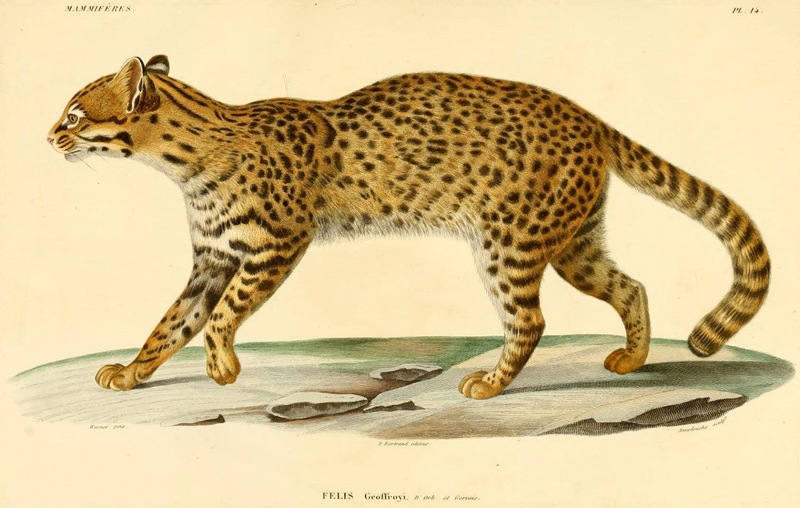 type] specimen is evidently not an adult animal; and from its resemblance to F. geoffroyi [Geoffroy’s cat, nowadays known scientifically as Leopardus geoffroyi], I felt certain, while examining it, that its habitat was not correctly given. During my late visit to Leyden I found another specimen of a Cat, almost precisely similar to Dr. Gray’s type, marked as F. geoffroyi, and stated to have been brought from Patagonia, the native country of that species. This Leyden specimen (which is also that of a young animal) by the kindness of Prof. Schlegel I have been enabled to remove to London, and thus to identify with the so-called F. pardinoides. The young F. geoffroyi appears to differ from the adult in the larger size and somewhat different arrangement of the spots, those upon the sides, shoulder, and rump being, as Dr. Gray describes them, “varied with grey hairs in the centre, making them appear somewhat as if they were formed of a ring of smaller black spots.” But the general colours of the animal, with its lengthened annulated tail, is precisely that of typical F. geoffroyi. Suddenly, India‘s F. pardinoides had seemingly metamorphosed into the already-described F. geoffroyi from Patagonia – in South America! Gray, however, did not agree with Elliot’s conclusion; and in a concise response published in the Annals and Magazine of Natural History for 1874, he sought to distinguish various morphological and cranial differences between his species and Geoffroy’s cat. Thus ended the odd little history of India‘s non-existent F. pardinoides. What makes this such an ironic (and embarrassing) episode for Gray, however, is that he had already made an almost identical error only a short time earlier with another wrongly-labelled felid specimen, giving rise to the equally ephemeral species Pardalina warwickii – Warwick’s cat. There is in the British Museum a Cat that was formerly alive in the Surrey Zoological Gardens, and was there called the Himalayan Cat, and which, in the ‘List of Mammalia in the British Museum,’ published in 1842, I called Leopardus himalayanus. This animal is figured, from the specimen at the Surrey Zoological Gardens, in Jardine’s ‘Naturalist’s Library’ as Felis himalayanus, Warwick. The figure is by no means a characteristic one. The Cat has not been brought from Himalaya by any of the numerous sportsmen and collectors that have searched that country. It is not known to Mr. Blyth [prominent 19th-Century zoologist Edward Blyth], nor to any other Indian zoologist to whom I have shown it; indeed Mr. Blyth states that he believes it to be a South American Cat. 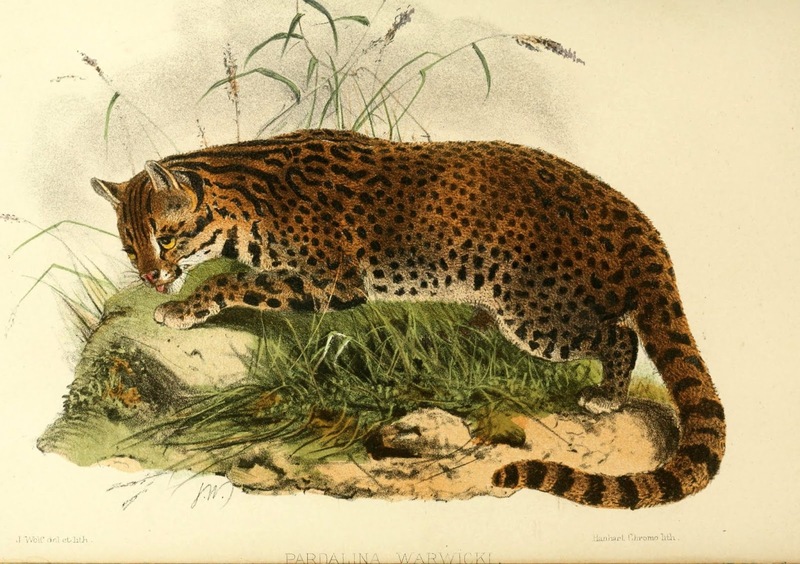 In stark contrast, Gray strongly disagreed with Blyth‘s classification of Warwick‘s cat, noting in his own PZSL paper of 1867 that its skull was very different from that of the fishing cat. In particular, he stressed the length of its brain case, the shortness of its face, and the convexity of its brow. As with F. pardinoides, however, it was not long after that latter paper had been published before the perplexing Pardalina was put under independent scrutiny, and Gray’s statements were found to be very wanting in both the taxonomic and the zoogeographical departments. 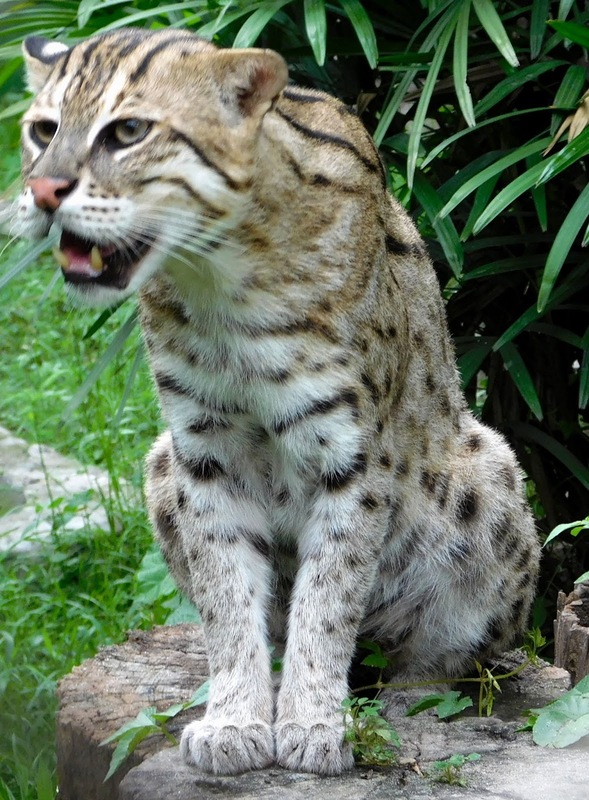 In 1870, the Zoological Society’s secretary, zoologist Philip L. Sclater, published a paper in its Proceedings that revealed the origin of Warwick‘s cat to have been far removed indeed from the Himalayas. In fact, it had been purchased alive from a Captain Hairby in Buenos Aires, Argentina, and had originated either in Paraguay or in Patagonia! Once again, a supposed Asian cat had been shown to be of South American extraction – but that was not the end of the unfortunate parallels in erroneous documentation between Warwick‘s cat and F. pardinoides, because studies of the former’s type specimen exposed it to be none other than another specimen of Geoffroy’s cat! Once again, therefore, in 1874, and in the very same volume of the very same journal in which he had recanted his opinion concerning the identity of F. pardinoides, Gray now did the same regarding Pardalina warwickii – reprising in his own defence his earlier statements concerning the absence of reports of such a cat in the Himalayan region and the craniological reasons why he deemed the specimen distinct enough to warrant its own genus. 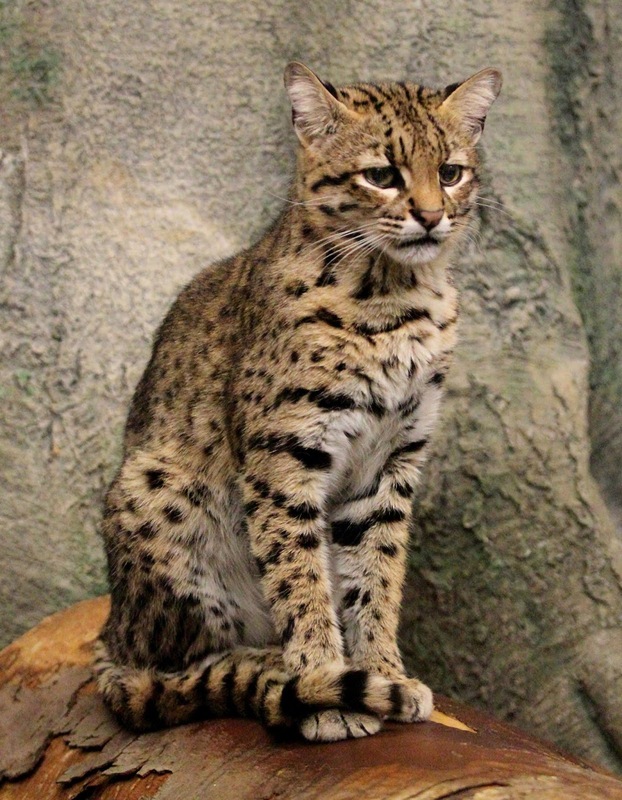 He also explained that because it was supposedly a Himalayan cat, he had never thought to compare it with specimens of Geoffroy’s cat or, indeed, of any other South American felid. When this cat was alive it was just the time that we began to receive fine skins of animals from the Himalayas; and there was an inclination of the dealers to give Himalaya as the habitat of animals of which they did not know whence they came, as animals from that country were interesting and fetched a good price…it has been suggested by Mr. Blyth and others that it may be an inhabitant of South America; but I have not seen any specimens from there. Poor Dr Gray – whereas some people superstitiously believe it to be black cats or white cats that bring bad luck, in his case it was most definitely Geoffroy’s cat! 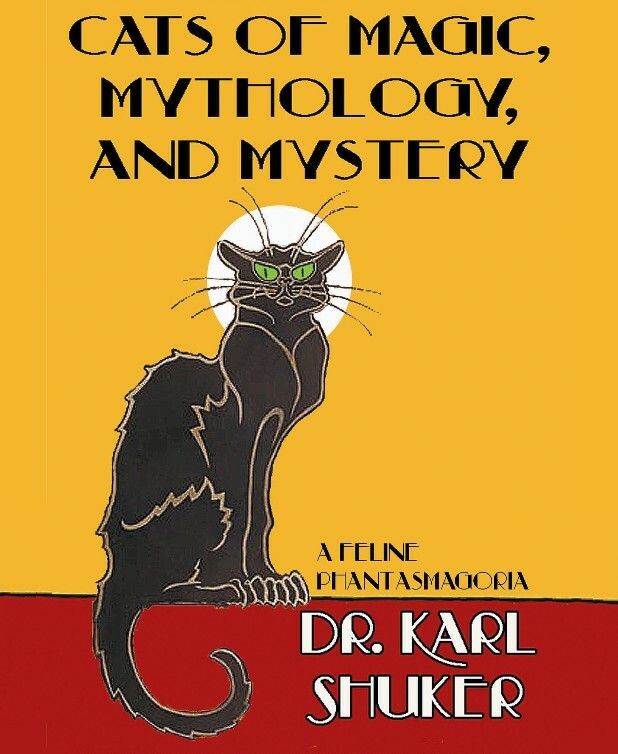 Indeed, it is fortunate that Oscar Wilde’s formidable literary creation, Lady Bracknell, was both fictitious and unassociated with feline systematics – otherwise, in her usual terrifyingly acerbic manner, she might well have observed: “To misplace one cat may be regarded as a misfortunate. To misplace two looks like carelessness.”! !